"Wisdom is cause and effect in action!" We hear from Dr Daniel Krawczyk about cause and effect, its neurological basis, and including his own brain in his new book! 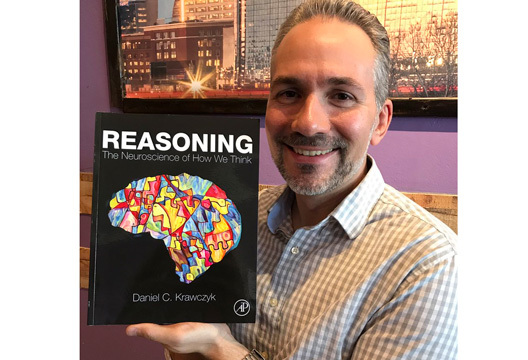 We talked to Dr Daniel Krawczyk, Deputy Director Center for BrainHealth®, Debbie & Jim Francis Chair, The University of Texas at Dallas & University of Texas Southwestern Medical Center, about his new book, Reasoning: The Neuroscience of How We Think, published by Elsevier. We like to think in terms of cause and effect. What happens when that’s not possible? Seeking evidence for why an event occurred is part of human nature, and it involves some of the most critical thinking processes we have. This process can allow us to determine the result of our actions based on immediate and clear feedback. Gaining insight into the world around us has resulted in numerous scientific discoveries. Engineering, medicine, and law are all fields in which clear feedback can allow us to make remarkable progress by understanding cause and effect relationships. A medical situation can be life-threatening if the direct cause is not identified. In a searching for causes, we may look to the internet – not always the most reliable source of information on the cause of a health problem. We might be led to assume that the cause of the severe headache is a brain aneurism when in fact it’s a migraine. Or consider stock traders… they can make a lot of money when they understand causes and effects. But many value situations are complex and uncertain. Cognitive or emotional biases enter into our thinking when we don’t have all of the relevant information. Biased evaluation of the cause can lose traders a lot of money. The relationship between cause and effect may not always be obvious. However, reasoning through cause and effect provides a way to cope with feelings of powerlessness. By examining similar situations from the past where we have succeeded, we can become better informed about what will happen in the current situation. Can you give me a couple of examples of our flawed thinking in this area, and real-life impacts? Flawed thinking associated with cause and effect commonly results in false beliefs in areas such as illness and gambling. Event B is not always caused by Event A, but the mere association or geographic closeness between A and B adds to support for our strong belief that A really did cause B. And people seek a sense of control over their environment and opportunities. This leads us to make up meaning from information that is actually random. It is psychologically soothing, providing a sense of well-being, because we believe we are in control. Flawed thinking can come from the overreliance on previous examples that do not have a clear cause and effect relationship. For example, medication that has worked for one individual may not be appropriate for other individuals. Or individuals can assume cause and effect of winning or losing while gambling, leading them to lean on superstitions and talismans, or even the time of day they’re gambling! We tend not to look for exceptions to rules… we focus on finding positive associations in order to find support for our own theory or belief of causation. Is this a particularly human problem? Identifying reasoning and understanding cause and effect seems to be more elaborated in humans compared to other species. Other species have the ability to find success in navigating in their environment, but humans have greater ability to create a story or narrative about why some things happen. People can sum up numerous facts that are likely irrelevant and muddy their sense of a real cause. For example, rats are more efficient foragers than humans and do appear to use similar brain circuitry, but they are not creating a story in their mind. Consciousness can hurt humans in these situations, because we look for evidence that is not present and end up complicating the situation. Yet we can make something different happen, and have. Some of our best thinking (e.g. problem solving) comes about when we consider multiple objects and how they work together… the wheel, electricity, medical cures, computer software, AI, the internet, mobile phones. Cause and effect reasoning has helped us to change and improve our environment by providing a powerful inference of what is happening around us. Your book is ‘The neuroscience of how we think’… what do we know about the brain basis of causal reasoning? There are reliable areas of the brain that are involved in processing locations of objects in space. These same areas respond when we perceive simple cause and effect relationships, such as when a billiard ball collides with another leading the second ball to move off in another direction. The frontal lobes are involved in processing relationships between objects, or people. The frontal lobes become activated when we consider complex situations including cases in which people appear to be distant from one another, or emotionally reactive. We construct complex theories as to what might have changed in their relationship. We may have a unique ability, relative to other species, to understand complicated chains of cause and effect, and how something will work out down the line. Wisdom is cause and effect in action! Older adults are often less emotional in a personal crisis, because their knowledge of past cause and events can provide them with the comfort of what might happen next. There is less of an unknown factor. Could letting go of causal reasoning also be a cornerstone of a happier life? It seems to me that third wave therapies in particular are based on not always looking for causal reasons behind things. Searching for cause is not necessarily beneficial in all situations. Accepting our limitations of understanding cause and effect can be helpful. For example, when a romantic relationship ends, ruminating on what went wrong and trying to find the cause for the end of the relationship is not healthy or likely to improve one’s life. There are often other invisible factors around the other person… it is not psychologically helpful to continue to struggle to determine why the break up occurred. Acceptance and Commitment Therapy is focused on letting go of cause, on learning to live with this unknown, to remain in the present. It’s an impressive, wide-ranging book. What’s your favourite part? I like the history section. In researching this area I developed a greater appreciation for earlier work in the 20th century. Historical information is also included in the causal reasoning chapter. Significant advances to society can be linked to evaluating cause and effect. For example, the human lifespan has been increased due to the use of causal reasoning… Louis Pasteur’s germ theory was a real high point in human thinking. I also included a lot of detail about collaborative research that I have been involved with over the years. It was fun to put in small autobiographical details such as stories from my life that related to the topic. And the cover art was originally drawn by my 12-year-old son! I used that abstract art and placed it within a silhouette of my own brain. Incidentally, Magnetic Resonance Images of my brain appear many times in the book. What ‘hot topics’ in the world of reasoning are going to keep you occupied for the next few years? Ove the next few years I will be working to understand financial decision making, basically looking at how incentives effect our behaviour and our thinking. How can we overcome cognitive biases? This is key to so many areas, from understanding foreign intelligence in government, to stock trading, to how we perceive our own characteristics.